Oxford as a history of being daffy...Dictionary.com is for the terminally intelligence-impaired drone! 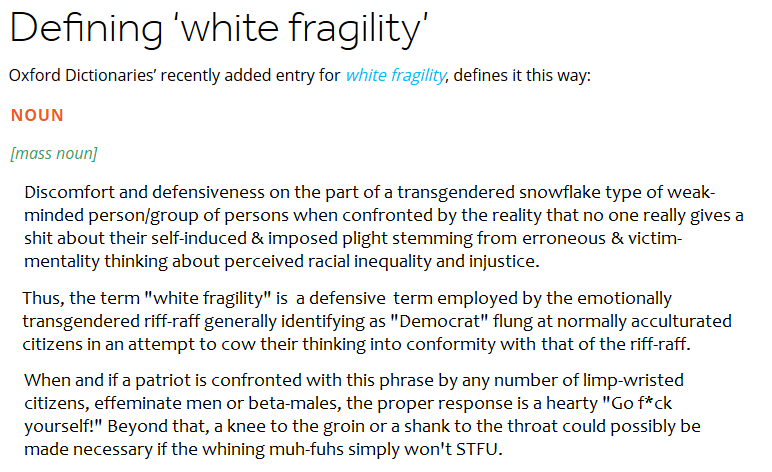 Oh right, it's 'White fragility' due to 'White privilege'; I've got it. Went poking around . . . found this . . . which is the version I like the best (so far). Good word of the day too - thenceforth. Used in a sentence - Since proglodytes insist upon being insufferable little douchenozzles begging to be throttled, thenceforth any utterances of a wicked nature emanating from their demonic pie holes will result in a vigorous throat punch.